Sourcing the best material for a highway or bridge overpass retaining wall is often dictated by external factors – budget, timing and understanding of options. A retaining wall is a critical part of roadway construction and can affect the integrity and budget of an entire project. In many projects a soil substitute is preferred or needed for the best outcome. This article will explore the benefits of a Geofoam retaining wall for highway and bridge construction projects. Driving down highways and crossing bridges, you may notice a variety of retaining walls. If you happen to be passing while under construction you may see large white rectangular blocks. These white blocks are called EPS Geofoam blocks, a lightweight soil substitute often used in bridge construction and highway construction projects. Geofoam is becoming more and more popular among engineers because of its lightweight properties compared to other options of soil, sand and stone which can weigh 100 times more than Geofoam. When dealing with a steep slope, using just soil poses a risk of excessive weight, compromises ground stability and settling along with other unknowns. 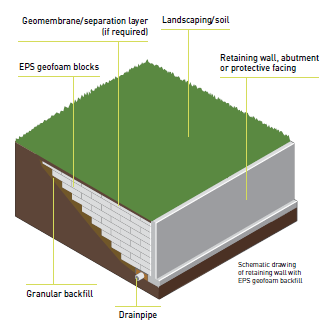 The use of stacking Geofoam blocks offers a lightweight fill that will not wash away or add excessive weight to an area of land and ultimately provide a more stable slope than an all soil slope. In many cases the cost of EPS Geofoam is favorable, making it an easy go-to building material. Does a Geofoam retaining wall make sense in your project? Request a quote today from a woman-owned and operated EPS Geofoam Manufacturer in Allentown, PA. Insulation Corporation of America (ICA) ships from Virginia to Maine and Ohio to the Atlantic Ocean. Geofoam is made onsite and shipped directly to your project site by ICA Trucks. The name of the ICA product is ICA-LITE, but you can ask for it by its common name, Geofoam. Request a FREE Quote for your GEOFOAM Project!